Synthetic peptide corresponding to Rat VAMP2 aa 1-18. Our Abpromise guarantee covers the use of ab3347 in the following tested applications. WB Use at an assay dependent concentration. Detects a band of approximately 19 kDa (predicted molecular weight: 19 kDa).Can be blocked with VAMP2 peptide (ab4958). Nervous system and skeletal muscle. Cytoplasmic vesicle > secretory vesicle > synaptic vesicle membrane. Cell junction > synapse > synaptosome. Neuronal synaptic vesicles. 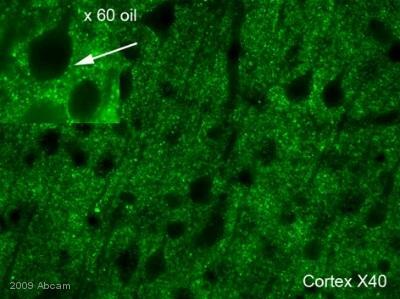 Western blot detection of VAMP2 on rat brain extract using ab3347. VAMP2 antibody (ab3347) used in Immunohistochemistry (rat frozen sections). Sections were fixed with paraformaldehyde. Primary Antibody ab3347 used at 1/1000 incubated for 18 hours at 20°C in PBS-T 0.3%. Secondary Antibody used anti-IgG Rabbit Conjugation Alexa Fluor® 488 Dilution 1/1000. Immunohistochemistry (PFA perfusion fixed frozen sections) - Anti-VAMP2 antibody (ab3347)Image from Zhang HH et al., PLoS One. 2012;7(10):e46666. doi: 10.1371/journal.pone.0046666. Epub 2012 Oct 2.Fig 2.; October 2, 2012 PLoS ONE 7(10): e46666. Immunohistochemical analysis of rat spinal cord dorsal horn tissue, staining VAMP2 with ab3347 at 1/200 dilution. Fluorescent-conjugated anti-rabbit IgG (1/200) was used as the secondary antibody. Publishing research using ab3347? Please let us know so that we can cite the reference in this datasheet. 1) the problem is we are not seeing any bands even in a control sample prepared from kidney cortex. 2) We are using protein samples from IMCD3 cell lystates. These were prepared using a RIPA lysis buffer. 3) The primary antibody is being incubated overnight at 4 degrees Celsius. Thank you for your reply and the additional information. Please let me know your order or PO number. If the antibody was purchased within the last 6 months, our Abpromise guarantee applies and I'd be happy to offer you either a free of charge replacement, a credit or a refund. Please let me know which option would be best for you. I look forward to hear back and resolve this case for you. We have attempted to use your Anti-VAMP2 antibody (ab3347) for Western Blotting. We have unfortunately had no success working with a 1:500 dilution. Is there a suggested protocol that you may be able to offer? I am sorry to hear that the antibody is not working as expected. I have copied the WB protocol below. 1) What is the exact problem (e.g. no bands, high background)? 2) What type of samples have you used and how were they prepared? 3) How long did you incubate with the primary antibody? Polyacrylamide gel electrophoresis and blottingAdd an appropriate amount of electrophoresis sample buffer (1X = 125mM Tris-HCl pH 6.8, 2% SDS, 5% glycerol, 0.003% bromophenol blue, and 1% beta-mercaptoethanol) to all samples. Heat to 95°C for 3-5 minutes. Load 5-100 ug total protein in a volume that is appropriate for the size of the wells. Electrophorese proteins for the appropriate time according to the manufacturers instructions. Transfer proteins from the gel to a suitable membrane (e.g. nitrocellulose, PVDF, etc.) following the manufacturers protocol for transfer. High molecular weight proteins (>120 kDa) can be wet transferred more efficiently if transfer time is increased and 0.05% SDS is included in the transfer buffer. BlockingRemove the filter from the transfer apparatus and rinse in PBST/TBST to remove loose acrylamide. Transferred proteins can be visualized by staining the membrane for 15-30 minutes with Ponceau S.
Remove stain from filter by washing with PBST/TBST. Place filter into blocking solution. Block for 30 minutes at 37°C, 1 hour at room temperature, or overnight at 4°C. Incubation with primary antibodyDecant the blocking buffer and add the antibody, diluted in blocking buffer as suggested in the product description sheet. Incubate with agitation for 30 minutes at 37°C, 1 hour at room temperature, or overnight at 4°C. Incubation with secondary antibodyWash for 30 minutes with agitation in wash buffer (TBS or PBS with 0.1% Tween 20), changing the wash buffer every 5 minutes. Decant the wash solution and add AffiniClear HRP-conjugated secondary antibody, diluted in 5% non-fat dry milk in wash buffer. Incubate for 30 minutes at 37°C, 1 hour at room temperature, or overnight at 4°C. Decant the antibody conjugate and wash for 30 minutes with agitation in wash buffer (TBS or PBS with 0.1% Tween 20), changing the wash buffer every 5 minutes. Substrate incubation (ECL)Decant washing buffer and place the blot in a plastic bag or clean tray containing the development working solution (0.125 ml/cm2) for 1-5 minutes. Agitate bag or tray to cover the surface of the membrane. Remove the blot from the bag or tray and place it between two pieces of write-on transparency film. Smooth over the covered blot to remove air bubbles and excess substrate.